*Warning this story has some graphic images but there is a happy ending! 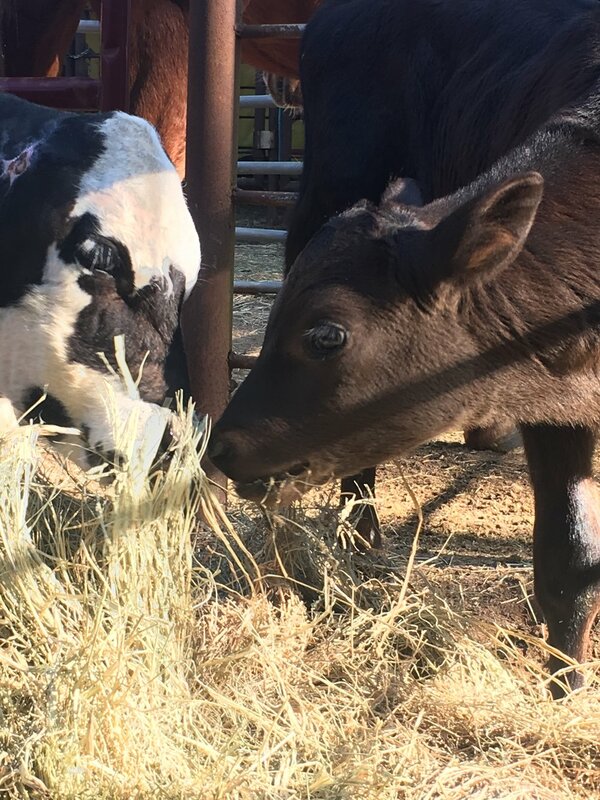 In March of 2018 we were contacted about a young calf with horrific injuries. She had been mauled by a pack of dogs. Her owners didn’t have the facilities or the knowledge of where to even start helping here. They asked if we could help and we said yes. Although I have worked with many wounds, I had never seen anything like this. The dogs had chewed her ears off and ripped her eye lids and lips. 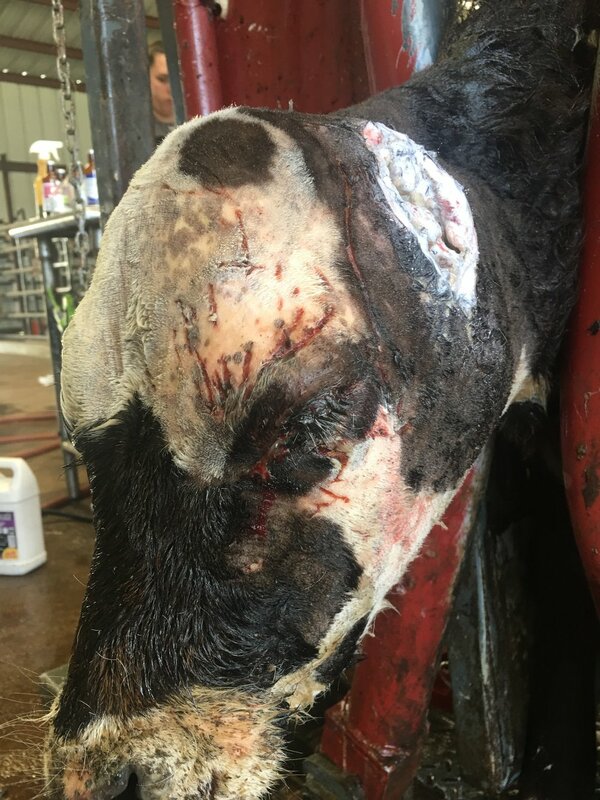 Her neck was brutally mangled with puncture wounds and teeth marks. Infection had already set in and all of the tissue was traumatized, so we went straight to the vet. Once we arrived at the veterinarian clinic, they began to shave the hair from around the wound areas. I felt like I had been gut punched! I was so angry and sad for this poor animal. They cleaned her wounds and trimmed the torn flesh that had been her ears. I was given a list of things to expect and how to properly medicate her. There was no antidote for shock or just giving up. In my mind those things were more dangerous than the wounds. Not to mention, would she be able to hear? 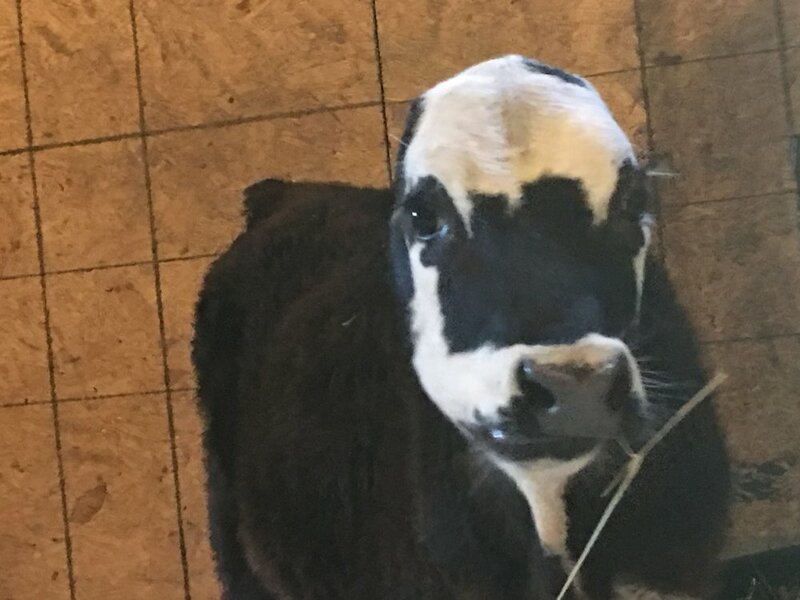 This calf was only five or six months old, she had never been handled, and now I have to medicate her ears and eyes daily. I thought to myself “This should be fun.” No matter the struggle, I was prepared to fight for her survival. Twice a day her ears needed medication and hydro-therapy. Her eye required medication four times a day and the wounds on her body needed to be clean and medicated as well. Do you know that she never - not one time - argued with me about taking care of her. I always felt that she knew I was trying to help. We decided to name this little darling Georgia! The first few weeks were tough. She seemed to be depressed but still fighting to heal. The soft tissue trauma around her head and neck was swollen and painful. 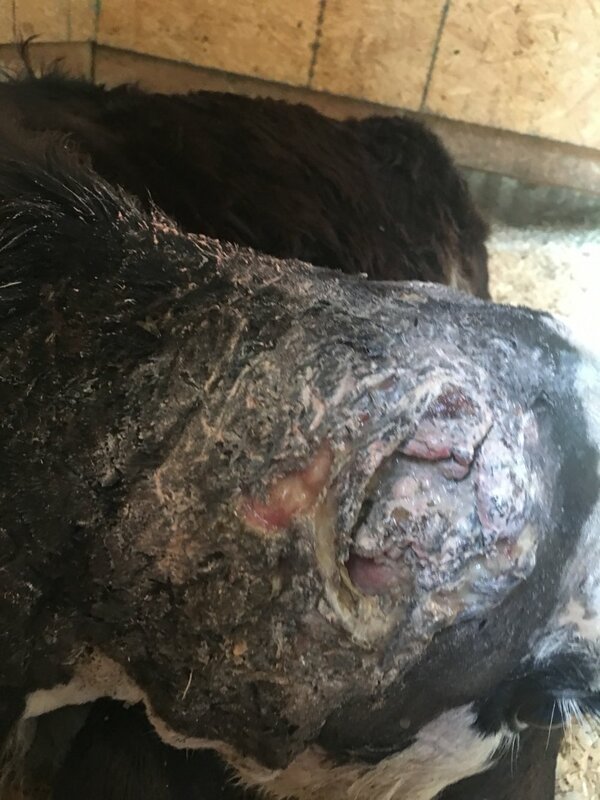 Dog bites are easily infected, which kept the focus on keeping the wounds clean from infection. Georgia’s left eyelid was ripped badly and was in danger of falling off. This was very important to avoid. Without the ability to blink and clean her eyes naturally, there was a great risk of future complications. Georgia could loose this eye in addition to her hearing. After all she had been through, the thought of her loosing an eye just broke my heart. She was such a good patient, calm and quiet. There were so many questions about her hearing, if it could be saved. The true challenge was to avoid scar tissue around the exposed ear drum. This was so important to not impair her hearing. Soon, Georgia’s wounds were healing, she became stronger and she began to show us that she could hear! 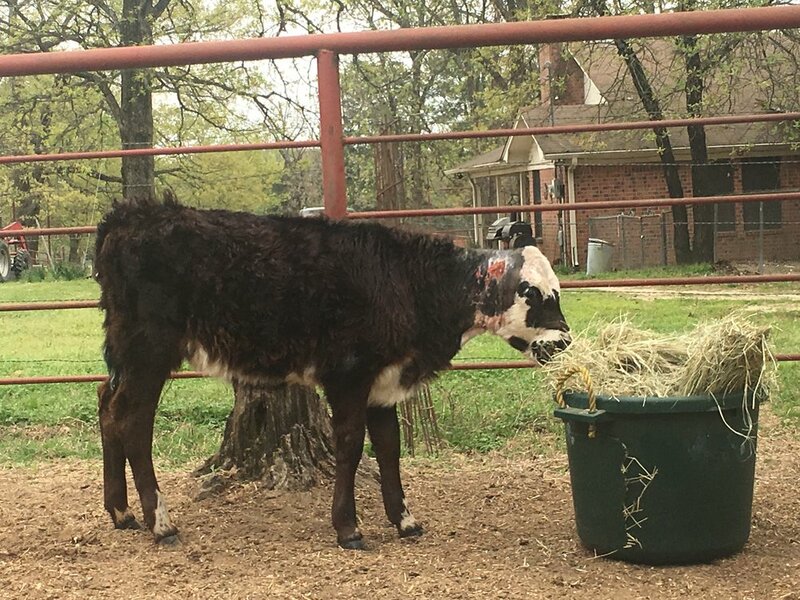 Georgia was confined to a stall since she had arrived, because I needed her to focus on me and healing, it was time to broaden her world! She need to play like a calve, build her muscles, and get some fresh air. Georgia began to go outside to eat and spend the day in the sunshine, but something was not right, she seemed sad. 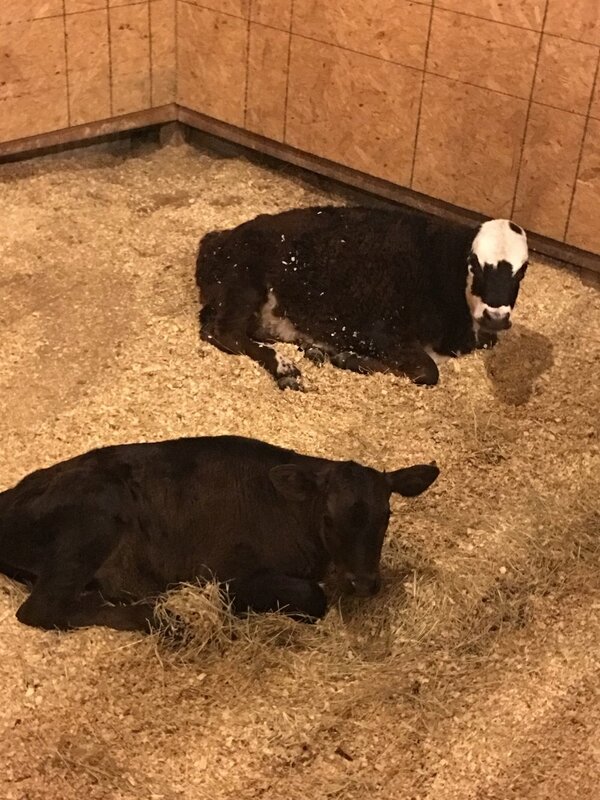 About this time we were contact about a calf that lost his mom and needed a home. Everything happens for a reason, right! So we brought home Spencer. Spencer taught Georgia how to play! She was jumping and kicking in no time. Finally this little girl was out of her depression. 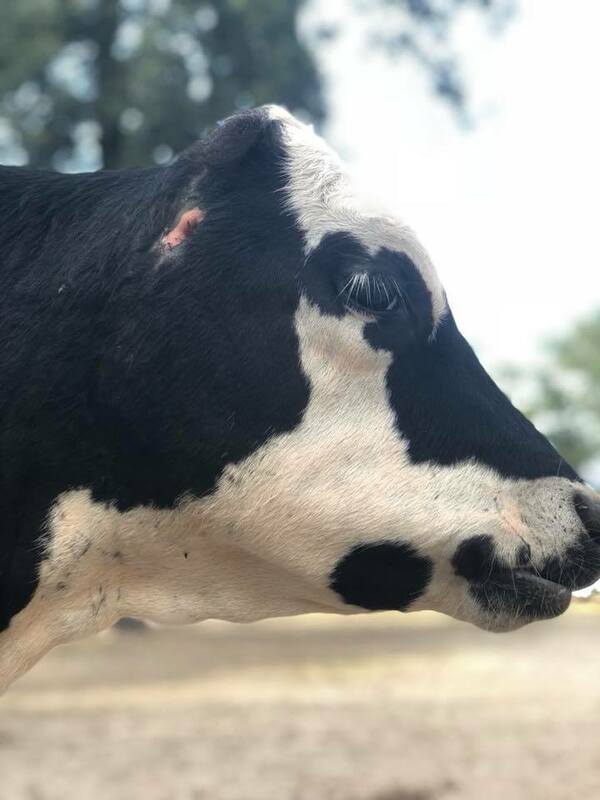 Georgia has overcome all of her wounds, although she does have scars to show her battle. She is a permanent member of our sanctuary and absolutely loves visitors. If you ever get the chance, stop by and say hi to Georgia.